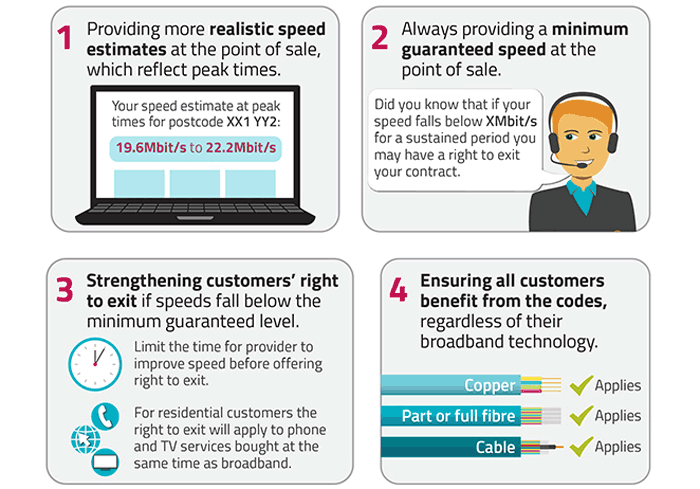 Ofcom has outlined some new measures today to help broadband customers get a better deal. There are a number of measures within this announcement and they broadly concern giving broadband customers better information about the product they are purchasing, and allowing customers to walk away from contracts that fail to deliver upon advertised promises. "These protections will close the gap between the broadband speeds people are sold, and what they actually receive. And to give people extra confidence, we are making it easier to walk away – without penalty – if companies fail to deliver": Lindsey Fussell, Ofcom Consumer Group Director. Advertised broadband speeds have been a thorny issue for quite some time. However, with lots of data now available about the speeds attainable at any of the UK's postal addresses, Ofcom has judged that ISPs can't be so woolly about things any more. In the future broadband firms must provide "a minimum guaranteed speed to a potential customer at the point of sale," says Ofcom. Furthermore, the broadband company must show more realistic peak-time speed information upfront, reflecting the fact that broadband is typically not as fast when many people are online. Peak periods span 8-10pm, or 12-2pm for businesses, thinks Ofcom. The above protections include penalties against miss-selling broadband packages. Not least if a customer's minimum promised speed drops below an agreed level, they can walk away without paying a penalty. If the broadband is bundled with other services like a TV and phone line contract, the customer can abandon the whole package. Ofcom, however, says the provider has "one month to improve performance," before the customer can leave. The current situation is that broadband customers can exit their contract early if speeds fall below a minimum guaranteed level and their provider is unable fix them - but there is no limit on the provider's problem resolution time. There is plenty of time for broadband providers to get ready for the above changes. They have a whole year until the guidance will be enforced, with packages purchased after 1st March 2019. And therein lies the problem! The only speed that the ISP can guarantee or has any control over is the speed of the connection to their internet gateway. Using something like speedcheck is pointless because there are too many variables. It will be line speed that will be guaranteed. The BT speed checker does measure the line speed, rather than to an arbitary server, so that is likely to be the test for guaranteed speed.